Sing a song uv sikspens, a pokkit fur uv kyoot! Foar n twenny blakburd saloot awn yoar nawt sekkund, tied wif teh puddy_tat. Thx Shensara – nawt shore we hab met uffishullee (Ai cud be rong, offn aer!) Ai offur mai paw in frenship. Purrhaps, been lurkin fer 3ish yeerz, I come owt frum unner teh cowch ebbry nao n den. ::shakes frenchips paws:: Ooo, danush…thankie! Gud 2 see teh famblee tye still holds! Wunner ware ebbriwun els iz! U mai be rite! Iz mornin in ‘Merica, raynjin frum juss startin werk 2 lunsh-tiem, so Ai spoze ebbriwun haz a bizzee. An Ai hab 2 go get mai dinner reddee. BBL, Bai! Kangaroo kitteh hazza purplol peeplol powch. Mehbii hii iz goin’ tew pediatrics tew play pattycake wif teh patients. She’s progressing. Contractions getting closer, udder fings getting wider. Teh yooshul. Water has not broke yet. Grandma jes fownd owt dat she gets tew bii in teh delivery ruum along wif husband. They’re wif hurr nao. 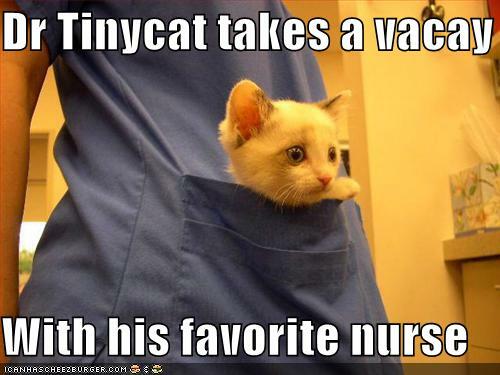 Mehbii dis iz maternity nurse adn kitteh iz bringing her tew teh hospital coz thar izza shortage ob dem. After awl, wi don’t wanna hab uh mid-wife crisis awn owr hand, do wii? Dis yer nawt sekkond grandkidlet NC? Oar shud aye sae Gramperz!! beems for a smooth delivery! *heddesk* – guud wun NC66! Hope awl goze well wif da babee delivery n hope Dr. Tinycat iz awn dat shift! ooh! yoo iz getting a noo grandbebbeh, nc66? awsum! pawz crossd for evreefing to go well! Ohai eberybawdy. Fanks foar teh well wishez. EM, Hii iz gunna bii mai fourth adn will balance owt teh genders wen hii arrives. Ai got twu of teh other three wif mii rite nao in teh waiting room. Wun wants tew gno wen shii can come ober foar a ride on the tractor, teh other iz flirting with the receptionist, and teh furd iz awn hurr way. Their aunt’s husband sez taht it almost seems liek she changed her mind about having their cuzzin’ today because teh contrakshuns aren’t az powerful az they were earlier. She haz a high tolerance foar payne, which ai fink is a factor in hao lawng dis mite take. So wii culd bii here sum whylols. P.S. Midwife crisis – yoo kwaks me up! Dat cuz NC66 dotter beez habbin a babbeh an he needs ta get der STAT!! Vacay ober furr now! bebbies aer teh bestist bee tehm furrie oar wifout teh furrie! wher iz him goin on vacayshun? hey …don let me haz awl de fun…. Got it… Ai iz bowing aowt ob dis alfabit bee cuz Ai nebber wuz guud at Kemistree. so wuz ai until ai dioskuvered wikipedium…. In Cheezland, the time is 19:22.